A Daily Diet For Carnivorous Cichlids and Larger Tropical FIsh. A Powerful Color Enhancing Daily Diet For Carnivorous Cichlids And Larger Tropical Fish Containing A Source of Live (Viable) Naturally Occurring Microorganisms. Expect vivid and vibrant coloration, not possible with other diets, as a direct result of the inclusion of easily synthesized Astaxanthin. Offering a super-charged nutrient mix enhanced with beneficial living microorganisms that promotes rapid, fat-deposit-free growth and active waste decomposition! Feed two to three times daily the amount your fish will completely consume in a few minutes. Care should be taken to avoid over-feeding and always remove any uneaten food after the feeding period. Ask your retailer about our other Cichlid diets; Cichlid StapleT, Cichlid Gold® and Cichlid Excel®. 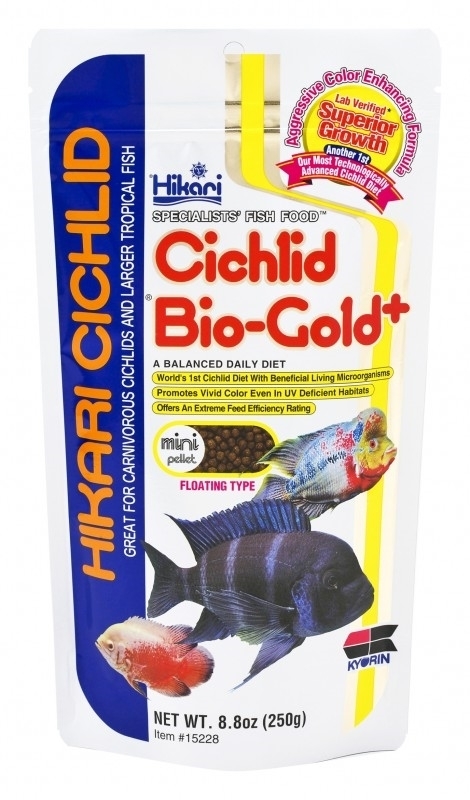 You must feed Cichlid ®Bio-Gold+ continuously for your fish to experience the full impact of the live (viable) naturally occuring microorganisms.